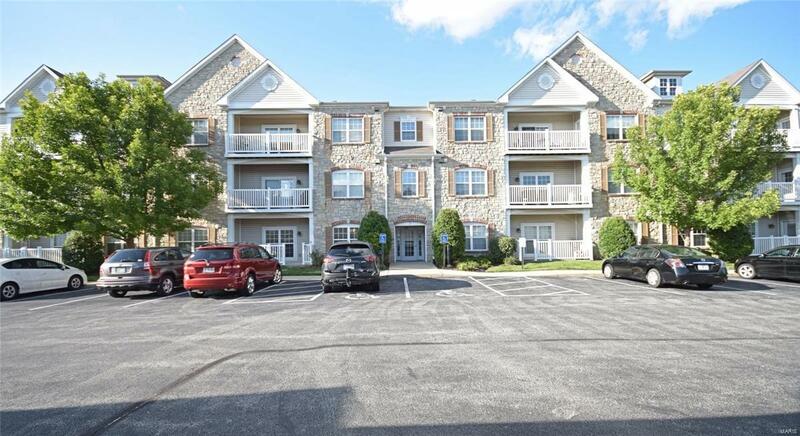 Fabulous Chesterfield condo has it all - spacious open floorplan, ground level unit, sparkling clean, and conveniently located with easy access to highways, shopping, entertainment, parks, and more! Large kitchen with lots of staggered height cabinetry, plentiful counter space, large pantry, tile backsplash, undercabinet lighting, and full complement of appliances, including a newer stainless refrigerator. Dine comfortably in the adjoining breakfast room. Huge living room feels even more so, thanks to tall ceiling and lots of natural light. Split bedroom plan includes spacious master suite with large walk-in closet and luxurious master bath, and versatile second bedroom with beautiful french door entry. Convenient laundry room with newer full size units. Private covered patio for peaceful outdoor living, plus lovely community gazebo, picnic tables, and grills. Convenient parking in the 1-car carport, across from unit. Secured access building. Additional private storage. Hurry!